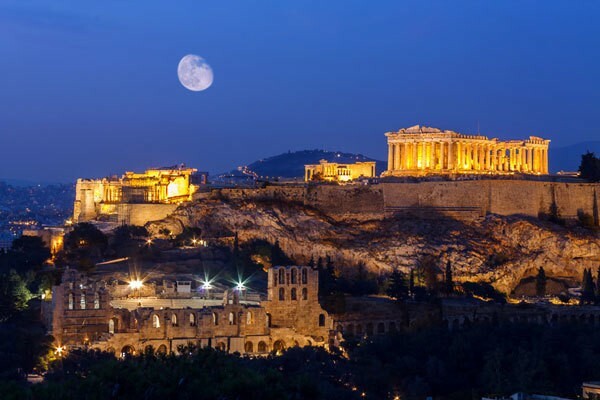 The National Anthem of Greece consists of the first two verses of the poem “Hymn to Freedom”, written in May 1823 in Zakynthos by the poet Dionysios Solomos. A year later it was published in Mesolonghi and the same year Fauriel included it in a collection of Greek folk songs. In 1828 Nicholas Mantzaros, a Corfiot musician and friend of Solomos’ set the poem to music, based on a folk theme, intended for a four-voice male choir rather than preserving it’s character of march. After that the “Hymn to Freedom” was regularly heard on national holidays. In 1844 the poem was once again set to music by Mantzaros and submitted to King Otto in the hope that he would accept it as the national anthem. In spite of N. Mantzaros being awarded the Silver Cross of the Order of the Redeemer and D. Solomos’ being awarded the Gold Cross of the same Order, the work was not ratified as the national anthem but became popular as a battle song. In 1861 the Minister for the Military asked Mantzaros to compose a march based on the “Hymn to Freedom”. 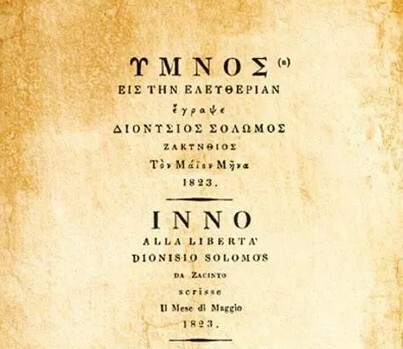 The musician altered the rhythm of Solomos’ hymn, giving it the rhythm of a march and in 1864, after the union of the Ionian Islands with Greece, the “Hymn to Freedom” was established as the national anthem. The national anthem, along with its music, was printed for the first time (27 copies) in London in 1873. The poem “Hymn to Freedom” consists of 158 four-line verses of which the first 24 were established as the National Anthem in 1865. The first two of them are the ones usually played and accompanying the raising and the lowering of the flag, being sung on official occasions. During the playing of the national anthem one stands to attention.